Having worked within the children’s party industry for the past 8 years we have seen and been part of many truly wonderful moments. Laughter shared between grandparents and grandkids. Comedic moments where the adults couldn’t resist getting involved in the children’s games, turning musical statues into a family dance party. There have been scary moments too, at a party last year a little girl had her hair catch alight as she attempted to blow out her Birthday candles, thankfully the day was saved by her heroic Father and a conveniently located pitcher of juice (She’ll get it right next year). Then there are the moments, simple and perfect, when the children have their faces painted. A sugar high, energetic and fidgety 3 year old will sit still and patiently await the outcome of their face paint choice. (Yep, this happens more often then not). However, nothing quite matches up to the moment when a child looks into the mirror to see the product of their patience. In that moment their face exudes excitement and surprise as the face painter shows them their reflection. It’s no longer just about a simple face paint as a bold and bright Lion, regal Princess, or fearless super hero is staring right back at them. It is in moments like these that we are reminded by their childlike wonder that anything is possible – and anything can be. We know why we love it, now here’s why you should too! – Face paint is fun. 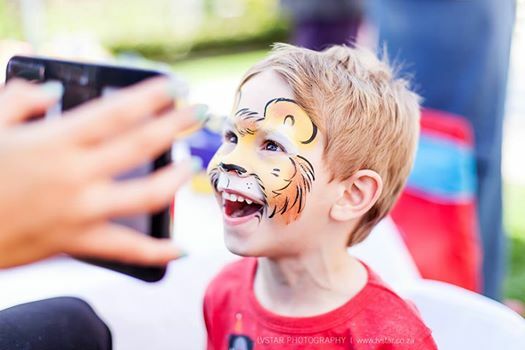 – Face painting adds amazing flair to your photographs. – It a great, social activity to keep the children busy at parties. Face paint quality is important. – We recommend the use of non toxic, hypoallergenic, water based face paints that are FDA approved, these are soft on the skin and keep irritations away. Quality face paints are also quick and easy to remove from the child’s face. How to remove the face paint once the party is over? – Without using any water apply a gentle, child friendly, moisturizer or make up remover over the whole painted area. Leave for several moments letting the moisture sink into the skin. Take special care around the eye areas so as not to cause discomfort to your little one. Now their face should be a “messy” looking wonderful muddle of colors. – Lastly take a damp cloth or wet-wipe and lightly remove the paint. Do it several times and you will start recognizing you child again. Continue till the face is clean of all face paint. Feeling creative? Here is a DIY pirate face painting tutorial video to get you started. 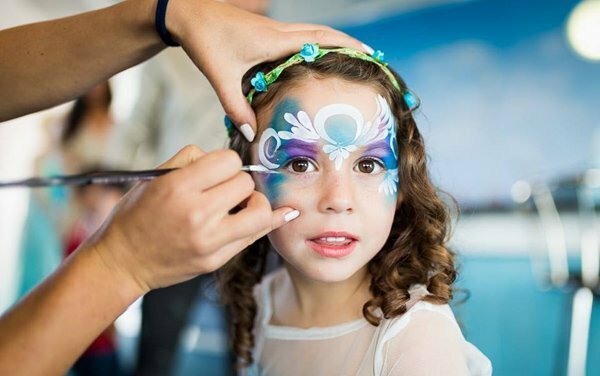 If you think the mission of DIY face painting is to daunting BOOK a professional face painter for your next event, party or playdate – We are Bazinga Parties.